Torqeedo’s lightest outboard, the Ultralight 403 AC, gets you to your favorite spot faster, and lets you stay there longer. It offers reliable performance, an innovative new angler mount and all the high-tech features of a genuine Torqeedo system: GPS built-in, real-time range and runtime display, solar charging and the latest lithium battery technology. Our extremely light Ultralight 403 AC fits on all popular types of kayak and canoes, and there are special models for special requirements. Learn about the benefits of our lightest motor, the Ultralight 403 C, for yourself. The battery has a capacity of 915 Wh, i.e. 31 Ah at 29.6 V.
When the battery is completely discharged it takes approx. 10,5 hours to fully recharge it. With the solar charger 50 W (accessory) you can charge anytime, during travel and while the sun is out. Can the Ultralight 403 C be connected to the steering? 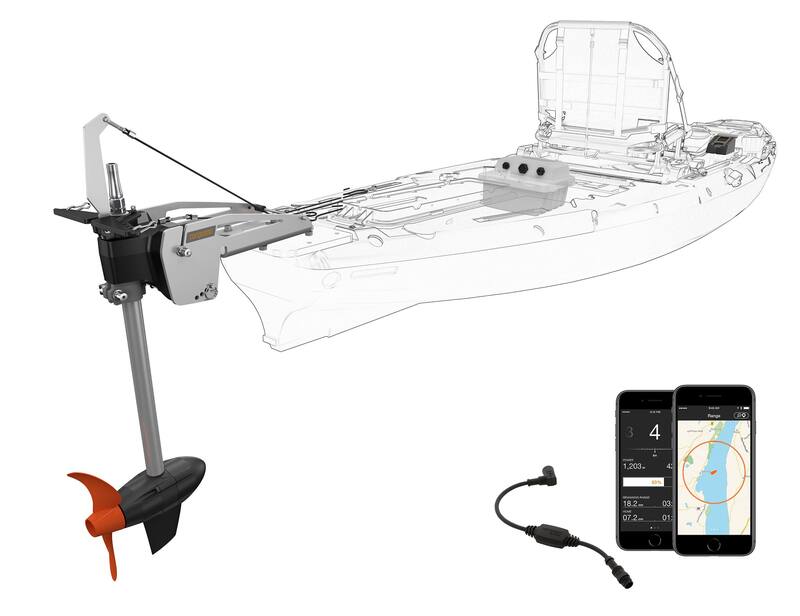 Yes, the Ultralight 403 C can be connected to your kayak's steering system. Please refer to your kayak's instructions and our information on mounting. What is the warranty on the Ultralight 403 C? The Ultralight 403 C has a 2-year warranty from the date of purchase for non-commercial use. All others: The ultralight 403 C can be mounted on just about any kayak using the mounting ball provided.